"Webinar: Marion Walsh, Esq., will discuss why the Endrew F. ruling represents an victory for students & how to use it. "Amy C. O'Hara Named To Board of Directors of Special Needs"
"All Grown Up ›› What to consider when your child with special needs turns 21—and is no longer a child," Westchester Parent by Samantha Neudorf featuring Bernard A. Krooks, Esq. "New York Elder Law Attorney Bernard A. Krooks Included Among The Best Lawyers in America©"
"What If Your College-Bound Child Has A Medical Emergency: FERPA AND HIPAA"
"Timely Tips for School Anxiety and Avoidance," Westchester Family, By Marion M. Walsh, Esq. "Moving to a New State When You Have a Family Member with a Disability"
"Do I Need A Lawyer? When To Hire An Attorney For Your Child With Special Needs or Suspected Needs," Westchester Family by Marion Walsh, Esq. 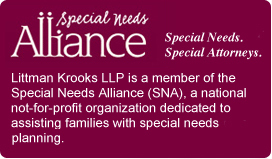 Insights from Bernard A. Krooks, Esq., special needs planning attorney. At Littman Krooks, we believe that all individuals are entitled to lives of dignity and social engagement, in accordance with their wishes and capabilities. We are committed to assisting individuals with special needs, along with the family members who care for them, in the building of fulfilling, economically secure lives. We have a track record of successfully working with the school systems in New York City, as well as in Westchester, Dutchess and neighboring counties. And because our New York special needs planning attorneys understand the complex relationship between government entitlements and personal assets, we can protect eligibility for crucial programs such as Medicaid and SSI, while helping you build an economic base that will support a comfortable lifestyle for your child. As your child approaches the age of 18, we can help you establish guardianship, if necessary, and we can support your efforts to prepare her for post-high school education, work, and in-community residential options. Because special needs planning and special education advocacy are core practices for us, we are always abreast of the latest developments in these rapidly changing fields. We also play leadership roles in both local and national nonprofits that serve individuals with special needs and their families. In fact, several of our attorneys found their way to special needs law because of family experiences, which means that for us—like you—it’s personal. We understand that building a life that’s rewarding and secure for someone with special needs is a family affair. Whether helping with a trust or special education matter, our lawyers understand that your family has a unique set of hopes and challenges. Let our team of New York special needs planning attorneys help you safeguard the future of your loved one. Bernard A. Krooks, Esq., recently appeared on Sirius Radio Stations, BronxNet and WABC Radio. He discussed the importance of legal and financial planning for a child with Autism. Bernie was a featured guest speaker on Sunday, August 11th at 5:00 AM on Mix 97.7 FM – The Best Music Mix, and 94.3/97.3 THE WOLF and at 7:30 AM on True Oldies 1390 & 1340 AM.